Researchers at National Jewish Health have identified a trigger for autoimmune diseases such as lupus, Crohn's disease and multiple sclerosis. The findings, published in the April 2017 issue of Journal of Clinical Investigation, help explain why women suffer autoimmune disease more frequently than men, and suggest a therapeutic target to prevent autoimmune disease in humans. 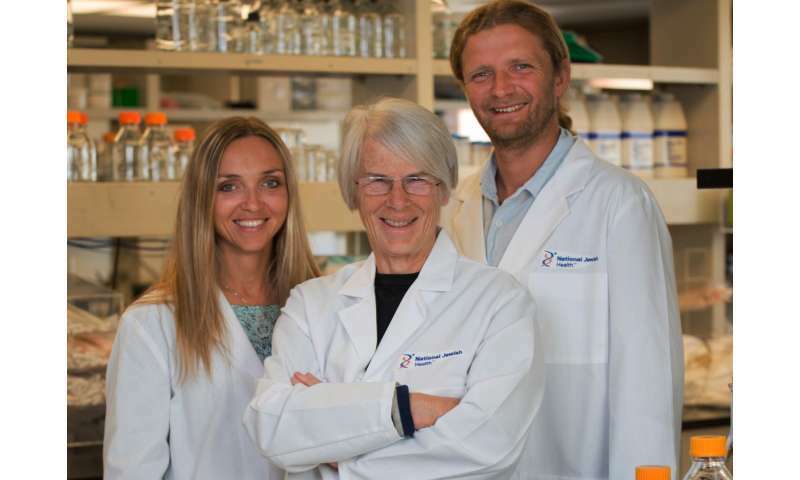 "Our findings confirm that Age-associated B Cells (ABCs) drive autoimmune disease," said Kira Rubtsova, PhD, an instructor in biomedical science at National Jewish Health. "We demonstrated that the transcription factor T-bet inside B cells causes ABCs to develop. When we deleted T-bet inside B cells, mice prone to develop autoimmune disease remained healthy. We believe the same process occurs in humans with autoimmune disease, more often in elderly women." Autoimmune diseases occur when the immune system attacks and destroys the organs and tissue of its own host. Dozens of autoimmune diseases afflict millions of people in the United States. Several autoimmune diseases, including lupus, rheumatoid arthritis and multiple sclerosis strike women two to 10 times as often as men. Overall, about 80 percent of autoimmune patients are women. There is no cure for autoimmune disease. B cells are important players in autoimmune disease. 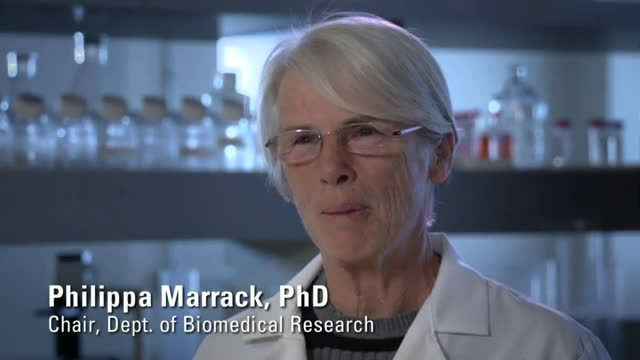 The National Jewish Health research team, led by Chair of Biomedical Science Philippa Marrack, PhD, previously identified a subset of B cells that accumulate in autoimmune patients, autoimmune and elderly female mice. They named the cells Age-associated B cells, or ABCs. Subsequent research showed that the transcription factor T-bet plays a crucial role in the appearance of ABC. Transcription factors bind to DNA inside cells and drive the expression of one or several genes. Researchers believe that T-bet appears inside cells when a combination of receptors on B-cell surfaces—TLR7, Interferon-gamma and the B-cell receptor—are stimulated. Through breeding and genetic techniques the research team eliminated the ability of autoimmune-prone mice to express T-bet inside their B cells. As a result, ABCs did not appear and the mice remained healthy. Kidney damage appeared in 80 percent of mice with T-bet in the B cells and in only 20 percent of T-bet-deficient mice. Seventy-five percent of mice with T-bet in their B cells died by 12 months, while 90 percent of T-bet-deficient mice survived 12 months. "Our findings for the first time show that ABCs are not only associated with autoimmune disease, but actually drive it," said Dr. Rubtsova. ABCs have attracted increasing interests since their discovery in 2011. Dr. Rubtsova and her colleagues at National Jewish Health have expanded their study of ABCs beyond autoimmune disease and are looking at their involvement in sarcoidosis, hypersensitivity pneumonitis and chronic beryllium disease. Why do women suffer autoimmune diseases more often? are we getting closer to a cure or a way of stopping progression?